Easy pasta recipes are perfect for busy weekday dinners. This one is so delicious you will want to make it often. It is full of healthy ingredients. Of course broccoli is one of the healthiest foods we can eat. We all know that a good quality olive oil is a storehouse of healthy fats. And herbs like the fresh parsley and basil bring their own high nutrient values to the dish. Place the chopped broccoli in a steamer and steam, covered, for about 3 to 5 minutes. Drain well. Cook the pasta in boiling water according to the directions on the package or until it is tender but still a bit firm (al dente). Drain it well. In a frying pan, warm the oil, Parmesan cheese, parsley and basil. Add the broccoli and cooked pasta. Toss it with oil and cheese mixture. Top the dish with a bit of freshly ground pepper. Serve topped with extra freshly grated Parmesan cheese. For color, extra flavor and more nutrition, add one red pepper cut into thin strips. Saute the strips for 2 to 3 minutes and toss in with the broccoli. You can also add 1 or 2 cloves of garlic to the saute. For more healthy recipes as tasty as our easy pasta recipes, browse our growing recipe collection. Maybe the cheese doesn't make this recipe a perfectly healthy dish in some people's minds, but there is so little and it packs so much punch in terms of flavor that in my opinion it is worth it to add it in. If you disagree, simply leave it out, or use vegan cheese and create a wonderful vegan pasta dish out of this recipe. This healthy pasta recipe is ready in just minutes. As the pasta water is boiling and the pasta is cooking, chop and steam the broccoli and chop the herbs. Heat everything together in a saute pan and add the hot cooked pasta. Easy peasy and from start to finish done in under 30 minutes! I love easy pasta recipes like this. 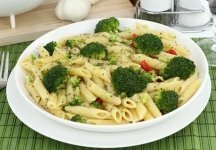 You can up the nutritional value by using whole wheat pasta instead of white. I never use white pasta any more. You may have to try it a few times to get used to it but it is terrific. I do find that, unlike white pasta, you don't want to eat whole wheat pasta too al dente (firm). It does need to be cooked through or it has a bit of cardboard texture to it. Of course, you can also use a non wheat pasta of your choice. Whatever works with your diet and lifestyle will work in easy pasta recipes like this.